Tired of gifting the usual boring stuff to your friends and family? These enterprising artists are offering some rather unique handmade gifting solutions. Dessert Palette offers eggless DIY dessert jars that make for a perfect gift to surprise your baker friend. Its one-of-a-kind DIY mason jars contain eggless pre mixes of cookies, brownies and hot chocolate with instruction guides that makes it super easy to bake. Our picks — 5-Star Brownie and Strawberry Hot chocolate. They deliver pan India. Pocket Pinch: INR 500 – INR 600. As the names suggests, ThiS AnD ThaT offers a variety of handmade products that make for amazing gifts. For instance, their collection of lamps that include floor, table and corner lamps come in a host of shapes and sizes replete with different kinds of ethnic prints. These make perfect gifts for a friend with a fetish for quirky home décor items. Pick up a set of smart travelling pouches or toilets kits for a friend who is always on the move. Their batuas are contemporary chic and can be paired with any ethnic or fusion wear. Gift one to your fashion-forward friend and watch them grin ear-to-ear. Our pick — the recycled bottle lampshade with Buddha or Namaboli print. Pocket Pinch: INR 600 – INR 1,000. Bee Craftsy is on a mission to bring the lost creativity back into gifting. Their handcrafted awesomeness includes travel journals, scrapbooks, memory keepers, baby albums, birthday explosion boxes and more. Bee Craftsy also does customised handmade invites and party favours for all occasions. Our picks – travel journal and baby record book. Pocket Pinch: INR 150 – INR 3,000. Pink Sakura makes incredibly good-looking home décor items. These make for perfect house-warming gifts or creative gifts for almost any occasion. 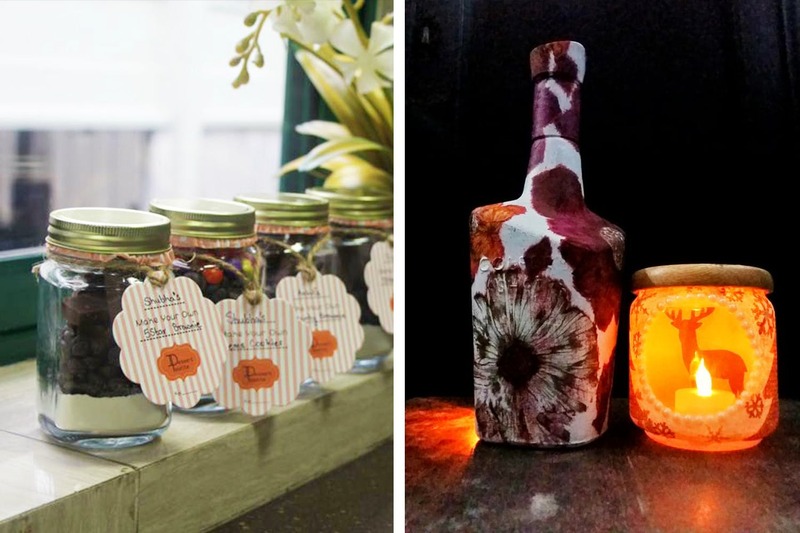 Think decoupaged floral vintage bottles and jars that can be used as vases or stand-alone show pieces. Their beautiful handmade 12ft string of lights can jazz up any dull corner of the house in a matter of seconds. Our pick – handpainted tea light candle holders. Pocket Pinch: INR 100 – INR 1,000. Rare Planet is all about Indian handicrafts. They work closely with local craftsmen turning simple everyday products such as kulhars and kettles into works of art. Once you hit up their website you will be spoilt for choice. From terracotta, ceramics and aluminium to hybrid leather products like wallets made with leather and cane to painted kulhars, the range is mind-boggling. Have a friend who is fond of earthy yet hatke things, then pick up anything from Rare Planet’s collection of feisty and artistically brilliant handmade products. Our pick – Calcutta-themed hand-doodled kettles. Pocket Pinch: INR 100 – INR 2,000.